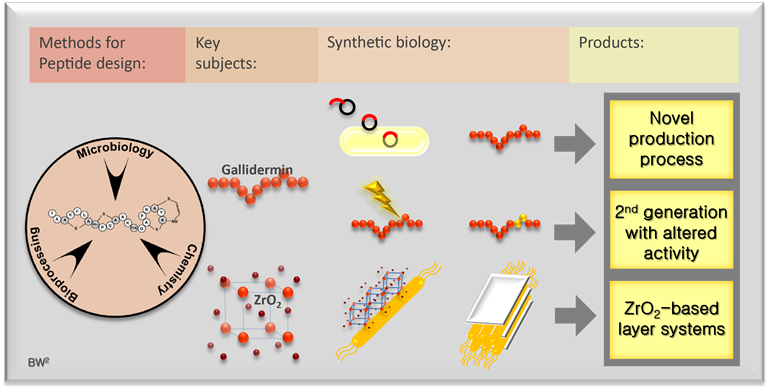 Within the research line ‘Functional Peptides’, emphasis lies on two major subjects: Gallidermin and Zirconium oxide. Gallidermin belongs to the class of lantibiotics, which are highly modified heterocyclic peptide-antibiotics produced by specific bacteria and act on a wide range of Gram-positive bacteria. Due to the fact that lantibiotics are ribosomally synthesized, they can be formed by recombinant technology to produce analogues which can be tested on altered activity. In addition to recombinant technology, we link biosynthesis with chemical modifications leading to new pharmaceutical products possibly with novel ways for manufacturing. With this approach of using synthetic biology, we want to pursue a new strategy for the production of Gallidermin and 'second generation' Gallidermin. The synthesis of Zirconium oxide (ZrO2) usually takes place under harsh reaction conditions. To develop production method using milder conditions, the combination of biology and material sciences is applied. Zirconium oxide will be fused to a template of M13 bacteriophages, in order to create zirconium oxide-based layers. These layers can be used for fuel cell technology, protective coatings and optical applications. In the research line ‘Functional Peptides’, the cooperation between chemists, microbiologists and bioprocess engineers should produce numerous of new compounds, which will be tested on their effect on bacteria, host cells or immunoreactivity.